The dashboard itself is visible only to viewers with Dashboard privileges. Any user can see the Help page you are now reading and view a demo of the Dashboard. But to see and use the Dashboard, you must be logged in with a Consultant account configured for Dashboard use. (To buy a Dashboard account, go here ($30.45 setup, plus $6.95 per user). After you buy the Dashboard, we need to configure your account accordingly, which may take up to a business day. We will email you when it is ready for use. To login, go to the Tools for Trainers item in the top menu on the front page of our site or click here. Login with the same login and password you used when you purchased the Dashboard. Make sure you have new user accounts available. To see how many user accounts are available to you, check the counter on the top right of the Dashboard. You can buy more here. Name. Whatever you enter here will appear at the top of that user’s Score Report. Eg: if you enter “John Doe”, at top of the Score Report it will say “Report for John Doe”. Spaces between names are okay. Password, entered twice. Password can be any combination of six or more letters, numbers, or symbols. You can ignore notices that say you must have all of those. If you are creating several users, you can use the same password for all, but remember that some users might figure this out and be able to access the score reports of their classmates. Best practice would be diverse passwords. Option 2: Enter user names in a .csv file and upload that file to the server. See option in left menu, Import List of Users from .CSV for instructions. This is by far the fastest option if you are doing more than a few users. All you have to do is enter names and emails in correct format into an Excel file, and upload it. This is much faster than option 1 of entering each name one at a time. The server is unforgiving in insisting that you create the .csv file in exactly the format described, but if you get this right, you can reduce registration time by at least 50%. The server automatically assigns a password when you use this option. If you have trouble loading a .CSV file send it to us and we'll do it for you at no charge. See the note about this in Import List of Users from .CSV. This option also gives you an extra data field for each user, a feature that is especially nice for profs with students in several sections. You can easily group students by section on your dashboard with this field. See the instructions at Import List of Users from .CSV about how to do this. After creating users, go to the list of them in the Dashboard by clicking "Go to Dashboard" in the Dashboard menu. The screenshot below shows the functions of the Dashboard related to users. Below the screenshot is instructions for the key settings. IMPORTANT: If you use the Global Send function, be sure to read section below "To Manage and Monitor the Dashboard", so you understand how to select multiple users properly. Regarding "Show Report to Users? Occasionally, trainers want to hand the Score Report to their users in a workshop or private meeting rather than have users see the Score Report at time of taking the inventory. To do this, this setting should be set to No. (For most purposes, we recommend setting this on Yes and letting users see their score report immediately after taking the inventory.) You can change the whole list at once by using the global change at the top. Or you can change users one at a time. You must click on Confirm after changing the setting. Explanation of the YES/NO settings: If under Show Report you click on Yes, your users will see a Score Report and have access to the tutorial on our site as soon as they take the inventory. If you click on No, they will instead see the screen below after they finish taking the inventory. Whether you use Yes or No on the dashboard, you will receive a copy of score reports of users as soon as they take them, sent to your email account. If you wish, you can send us a note or call with a request to switch off the automated sending of these reports to you. Or you could set up a filter in your Inbox to automatically delete them as they arrive, or to forward them to another account. Edit the Registration Note to your requirements. In the Consultant menu to the left of the Dashboard is a button "Edit Registration Note". When you click on it, you will find an easy-to-edit page already pre-filled with suggested text. Edit this as you wish, including, if appropriate, instructions about printing out the score report and bringing it to your workshop. There are a couple sections of the registration note you cannot edit: The sentence with a clickable link for users to go to the inventory is not accessible to your edits. Neither is the paragraph with the information for manual login. 2. Register one group and click on each person's button to send the note. 3. Re-edit the note as desired for the second group (and save it). 4. Register the second group and click on each person's button to send the note. Test to make sure your edits come through on the email sent. Set up a user account with an email address you have access to. You have to use a different email than the one you used in registering your Consultant account, as the site will not allow you to register the same email twice. After you've edited the Registration Note to your satisfaction, find this user account in the Dashboard and click on Send Registration Note to this user. Then go to your email account and take a look at what comes through to make sure it looks ok. We'll be glad to give you an extra user - or several - free for testing if you want. When you are satisfied with the text of your Registration Note, all you need to do to send it to a user is click on the button "Send Registration Note". You can click for each user to send the note. If you are sending to a lot of users, use the multi-user function. Click on the box to left of each name and then, at the top of the Dashboard, use the multi-user Send Registration function. But be aware that when you user Global Send, the server sends only to the users on the page of the dashboard visible when you click the Send button. See the 2nd note in the "Important Notes" section above to learn how to change the number of users visible to All (in the lower right hand corner of the dashboard). Log of Registration Notes. 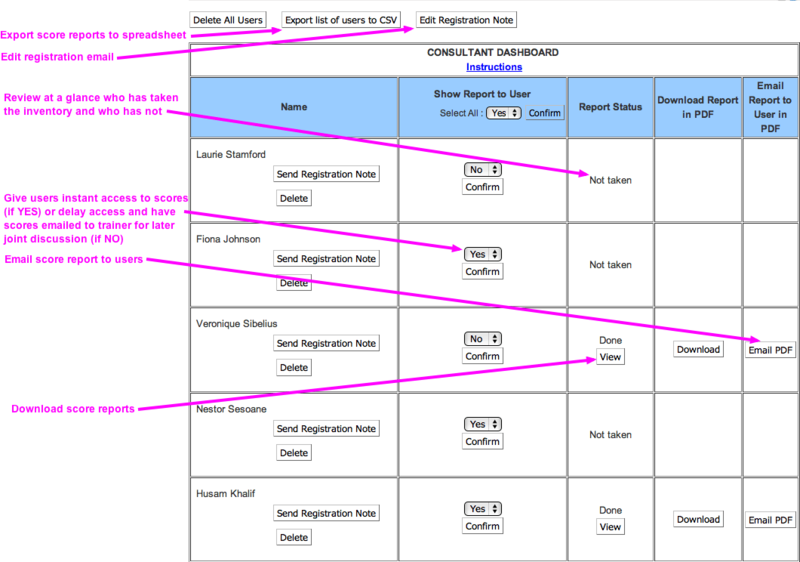 In the left menu of the Dashboard is a Log of Registration Notes to see a list of those users to whom you sent registration notes and when. You must click Confirm after changing the Yes/No setting. This applies to both individual and global changes. If you do not, the new setting shows on your screen but is not in fact recorded on our site. You will know the change has taken effect when a small notice appears after you click on Confirm to let you know you have been successful in changing the setting. If you use Global changes you must choose how many users you want to change at once. When you use the Global Select box in the gray top at the upper left of your dashboard, only the users on the page visible at that moment will be affected. So if you want to change settings for all users in your dashboard at once, you must first change the setting on the upper right corner of the dashboard to make All users visible on one page. 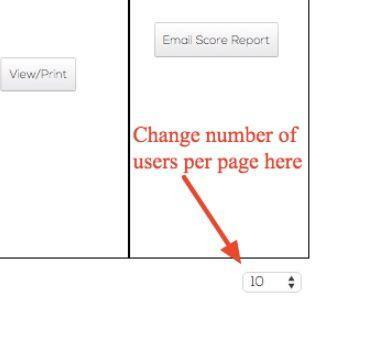 Just beneath the red letter text showing your user count, you will see "Number of Users per page" Choose All or however many users you want to see on each page. Important: If you have 100 or more users in your dashboard, it takes several seconds to re-load the page after every action. If the screen goes white, it's not a malfunction, you just have to wait till this huge page loads! If you leave the setting at 10 or 20 or 50, the dashboard will display that many users per page. A change in this setting takes place immediately, and it does not have to be Saved. You can easily change it back to previous settings. If you have a lot of users in the dashboard, on many pages, you can see the number of pages on display beneath the dashboard and you can click on those numbers to navigate to other pages. There is a LOG button on each user that records all communication with that particular user. There is also a Log of Registration Notes Sent in the left menu of the dashboard that tracks mass emails. In addition to the Registration function described above, you can easily send a communication to all your dashboard users or those you select by using the Send Note function. In the left menu, click on the Send Note menu item. Enter your text there and Save it. Then go to the Dashboard and click on the box beside those users you want to receive the note. If you want all to receive it, click on the box in the top row and it will select all. (See Important Note 2 above - it sends only to the users visible on one page, but you can change that setting on the lower right of the dashboard.) Then use the Multi-User button in the top of the Dashboard and select Send Note in the drop-down menu. MONITOR USERS AND SEE WHO HAS TAKEN THE INVENTORY. To see who has taken inventory. You can at any time see who has taken the inventory and who has not by going to the Consultant Dashboard. You must be logged in, of course, to be able to view your users on the Dashboard. Receiving copies of score reports by email. A copy of all score reports from users in your dashboard is by default sent to you as owner of this dashboard, going to the email address you used in registering this account. If you prefer not to receive these, you can easily change this yourself. In the left menu, click on Autoforward Score Reports. There you can switch off autoforwards or add an additional email account to receive copies of score reports. This additional account may or may not be otherwise registered in the Riverhouse database. Log of all interaction with a given user. In the Name column, there is a small "Log" button for each user. Click it to access a record of all events for that user. Events recorded include: Sending the user a Registration or special Note, Taking the inventory, Downloading the Score Report to the consultant, Sending a link to the Score Report from the dashboard to the user. Users whom you Archive can be restored again to the Dashboard later by using the Restore function. Users you Delete from the Archive are permanently removed. 1. Click in the box(s) to the left of the name(s) you wish to archive. 3. Name will be moved to the Archive but is still in the system. User cannot access their account when their name is in the Archive. 1. Click on “View/Restore Archived Names” at top right of Dashboard. 2. Click in box to the left of name you wish to restore to Dashboard. 4. Name will now be moved to Dashboard. 3. Find the users name in the Archive. 4. Place a check in front of the name. 6. Name will be deleted from the Riverhouse ePress system. Note: Permanently deleting the name of a person who has not taken the inventory gives you an additional user slot on your Dashboard. If you want to delete someone's account and make a new one for them, you have to both Archive and Delete Permanently that person's email from our accounts. The server will not allow two accounts to be established for the same email address. - October, 2015. Updated info regarding new functions for managing, searching and deleting users. - February, 2016. Added info on Global Send function. - March, 2018. Updates about the simplified process for Registration notices.